News of Madero’s murder led Villa to return to guerrilla warfare against Huerta. Zapata had never actually stopped fighting since Madero had refused to approve large-scale land reform, but Huerta was confident he could handle both of them. The situation worsened when Venustiano Carranza, governor of Coahuila, assumed leadership of the revolution. Despite Huerta’s contempt, Villa had built up a professional army, while Zapata had become a skilled guerrilla, who organized rebellions in several states. Huerta would have been overthrown sooner but Carranza resented Villa’s insistence on autonomy, and gave more resources to Alvaro Obregon, a more loyal general. Huerta resigned on July 15, 1914 and fled to exile in Spain. Carranza thought that he was the natural choice for president, but Villa and Zapata had the two largest armies in Mexico, and they both detested Carranza. Carranza on his own was no match for either Villa or Zapata but Obregon still nursed a grudge from when Villa had tried to execute him. Since Zapata had little interest in events outside of Morelos, Villa was left to face Obregon alone. Several days of fighting at Celaya proved that Villa was simply a charismatic cavalry leader, and when he limped back to Chihuahua, he no longer had the largest army in Mexico. Since both Villa and Zapata were contained in their respective strongholds, Carranza was able to take control of the rest of Mexico. Tired of the constant warfare that had turned Morelos into a burned-out hulk, many zapatista leaders simply refused to fight, and a desperate Zapata was assassinated in April 1919. Carranza made a fatal error when he opposed Obregon’s candidacy for president and ordered his arrest. Obregon won the support of most of the army and Carranza was killed trying to flee Mexico in May 1920. Obregon had not forgiven Villa’s attempt to execute him, but allowed him to retire in exchange for peace, which ended the revolution after ten long, blood-soaked years. A group of villagers, including Emiliano Zapata (Marlon Brando), meet with Porfiro Diaz, seeking assistance in a land dispute with the local hacienda, but realize that despite Diaz’s promise to uphold justice, he will not intervene on their behalf. An attempt by the villagers to check the boundaries of disputed fields results in an attack by the hacienda’s thugs. Zapata fights back, so he is forced to hide in the mountains with his brother Eufemio (Anthony Quinn) and his friend Pablo (Lou Gilbert). Fernando Aguirre (Joseph Wiseman), a representative of Francisco Madero (Harold Gordon), tells Zapata about Madero’s call for a revolution. Although aware of the injustices faced by the peasants, Zapata decides to manage the stables of a rich patron in order to gain sufficient status to marry Josefa Espejo (Jean Peters). After interfering in an unfair arrest, Zapata loses any hope of social advancement and joins the revolution. Diaz is compelled to abdicate, but Zapata soon discovers that he and Madero have diametrically opposing viewpoints. The situation worsens when Madero loses power during a coup orchestrated by General Huerta (Frank Silvera), so the fighting starts again. 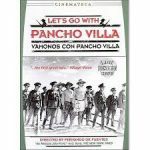 The forces of Pancho Villa and Zapata drive Huerta into exile, but Zapata discovers that the pressure of ruling Mexico challenges his ideals. Fay Roope, the actor playing Diaz, nails the dictator’s mixture of paternal benevolence and ruthlessness. Calling the village delegates his children, Diaz tells them to be patient, even though the local hacienda already has guards on the village’s fields, but the fatherly persona conceals a vicious willingness to ruin anyone who opposes him. 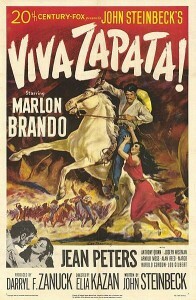 The movie is about Zapata, so he is the firebrand in the village’s delegation, and stands up to Diaz. Actually, Zapata was the junior member of the delegation, and since the real village chief was deported, it seems unlikely that Zapata attracted Diaz’s attention. Since Zapata has to fit the image of the stereotypical peasant leader, he can not read and he comes from a poor family with no land, therefore his proposal to marry Josefa is rejected out of hand. This portrayal overlooks the fact that Zapata’s family were prosperous farmers, who were able to provide him with enough formal education to be able to read. In fact, Zapata had proved to be a thriving entrepreneur, so he was considered to be a good catch. Although the movie presents Zapata as Madero’s first choice to lead the revolution in his state, the reality was quite different. Zapata had reclaimed his village’s land in December 1910 because Diaz wanted stability in the south while he concentrated on the growing threat posed by Madero after he fled to the United States in October and called for the revolution to start on November 20, 1910. Furthermore, Zapata had not been made part of Madero’s network, since Morelos was not considered a key area, so he was not touched when the police arrested Madero’s entire network in the south. Aware that none of the village’s gains would be permanent if Diaz continued as dictator, Zapata sent Pablo Burgos to meet with Madero in Texas to discuss an alliance. When Burgos returned in mid-February 1911, he carried a message from Madero that Zapata should serve under Burgos. Although Burgos was officially in charge, Zapata set the strategy. Tiring of the chaotic nature of a revolution, Burgos left but was executed by federal troops, while Zapata had been elected head of the rebels in the south. 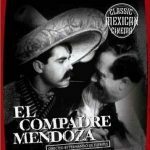 There is no denying that the real Madero did not possess the right temperament to govern Mexico and oversee lasting change, but he is not represented fairly in the movie. It is true that Madero wanted to implement change slowly after careful study. Having come from the same social environment that had produced most of the hacienda owners that dominated the villages, Madero was incapable of comprehending the villagers’ deep-rooted need for legal title to their lands. When Madero requested that Zapata’s guerrillas disarm, the genuine Zapata did justify his refusal by stating that a man without a gun could not keep his gold watch from a man with a gun, but it is highly unlikely that he pointed a gun at Madero to illustrate the point. The decision to force the revolutionary armies to disarm was Madero’s fatal error, since the regular army had feared the tough rebels like Villa and Zapata, not Madero. In the movie, General Huerta and his fellow officers act like sharks, circling a weak Madero, who does not fully grasp the danger of the situation. Using the threat posed by Villa and Zapata, the screen Huerta makes Madero a prisoner, ignoring the coup led by Diaz loyalist General Bernando Reyes. To be fair, much of the revolution had to be cut from the script since the budget was too small for a three-hour-long epic. However, the script’s failure to show that Madero did not actually have any power during the first few months after the abdication of Diaz deliberately misleads the viewers. Dismissing the objections of most of his supporters, including Villa and Carranza, Madero had not only refused to purge the government of Diaz loyalists, but had agreed that Foreign Secretary Francisco Leon de la Barra would serve as interim president until new elections were held. The screen Huerta disobeys Madero, but in reality, De la Barra had sent Huerta to impose federal control on Morelos. The real Madero was not completely helpless, just naive and simply oblivious to the harsh realities of poverty. 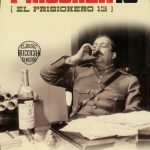 Madero had never wanted a revolution, was uncomfortable with the violent, rough-edged men who had led the revolution, and did not believe that any major changes were required once Diaz had resigned. As the fighting progressed, the guerrillas became increasingly paranoid, and the film captures the feuding between rival intellectuals in the movement where the loser would either flee or find himself standing in front of a wall with rifles pointed at him. However, it was incorrect to show Zapata taking a hands-on role in the executions. While he would order the execution of close aides, he would never be present for the execution because he was too emotional and could not bear to watch. In the movie, Villa and Zapata bond immediately, but the real men were very guarded with each other. Accustomed to the dominant role in their respective armies, neither man was comfortable cooperating with an equal. Desperate to go home to his ranch, the screen Villa convinces Zapata to serve as president, which is absolute fiction. History was rewritten in order to prove that revolutions end in tyranny, and the evidence is presented during a pivotal scene when a delegation arrives from Morelos with a complaint about Zapata’s brother Eufemio. Despite his claims to be a simple farmer, President Zapata has become like Diaz, and does not tolerate dissent. The shock of seeing a younger version of himself wakes him up and he returns to Morelos. A mirror image of the opening scene of the movie, the scene was designed to show that power corrupts. However, Zapata was never tempted by power, and he had zero interest in national politics, wanting only to be left alone in Morelos. Moreover, Eufemio was never criticized by Zapata, regardless of the increasing number of victims of his drunken rampages, and he was killed by a tough chieftain after beating the man’s father to death, not by a jealous husband. It is vital to remember that the film was made during the early days of the Cold War, when Stalin’s tyranny had become better known, so the film was meant to be an anti-Communist statement. The script shows that power corrupts, and even states that “a strong people doesn’t need a strong leader. Strong leaders make a weak people.” Having left the Communist Party USA in 1935, Director Elia Kazan was a born-again anti-communist who intended for the movie to educate viewers about the evils of the totalitarian nature of the Soviet Union, sweeping under the rug the inconvenient fact that Zapata never became a tyrant. The real Zapata despised Mexico City and left after arranging the new government with Villa. Kazan later mentioned that Fernando symbolized the people he used to know in the Communist party, who had all the answers. Moreover, the script reinforces its focus on tyranny by having Villa and Zapata determine the fate of Mexico while lounging under a shady tree. Admittedly, the brief meeting between the two men where they agreed on one thing only, the denial of the presidential chair to Carranza, did take place in private, but they still had to send delegates to the Convention of Aquascalientes, which was held after the exile of Huerta to select the new government, to convince the remaining delegates to reject Carranza in favor of another candidate. The depiction of Zapata’s end is correct, and it is true that many people believed that he was still alive, even those who saw his body. The story moves quickly and Marlon Brando has presence, but the real star is Anthony Quinn, who steals every scene. Quinn had lost out for the part of Zapata, but since he was half-Mexican, Kazan listened to his advice and incorporated several of his suggestions into the script, including the scene where Eufemio starts banging two rocks together to call the villagers to rescue Zapata. Jean Peters is a bold Josefa, explaining the parameters of the courtship to Zapata with frank honesty: If taken by force, she will kill him in his sleep. She wants a calm life with a rich man, so he should come back when he can offer her that life. Later in the movie, there is a slightly bizarre courtship scene with Josefa and her mother that is conducted entirely in proverbs. While the various courtship scenes, formal and informal, are a delight to watch, the real marriage was as much a business alliance as a love match, and Zapata was far from monogamous. Several scenes of Zapata being unfaithful to his wife were cut, probably to satisfy then-current beliefs on morality. Impressed by photographs of the revolution, Kazan faithfully recreates the famous image where Villa is seated in the presidential chair with Zapata next to him, surrounded by their followers, but Brando fails to project the real Zapata’s mistrust of the camera that appeared in all of the pictures taken when he was in Mexico City. Kazan and screenwriter John Steinbeck studied the real photos carefully, so Brando looks like Zapata, although the fake eyelids are disconcerting. In fact, Brando had a surprising amount of makeup, wearing a mustache, applying skin coloring, and using hollow plastic pipe stems to widen his nostrils and liquid latex to slant his eyes slightly. While Brando’s mumbling is occasionally annoying, he threw himself into his role, struggling to build a character that was almost completely different from himself. Kazan had been thinking about making a movie on Zapata since 1943, and he had started cooperating with Steinbeck in 1948. Steinbeck had performed in-depth research, interviewing people who had known Zapata to better understand the man and his time. Although producer Darryl Zanuck shared Kazan’s anti-communist approach, Zanuck saw the movie as a high-level western, not a political story, so Zanuck pressed Kazan to have Zapata ride a white horse to symbolize that his body could be killed, but not his unconquerable spirit. Kazan hated the idea, but he did not fight Zanuck over it, focusing his energy on the battle to have Brando, not Tyrone Power, star. Believing that the film had to be made in Mexico to achieve authenticity, Steinbeck and Kazan scouted locations in Mexico in 1950. However, after presenting the script to the president of the Mexican Syndicate of Film Technicians and Workers, they were informed that Zapata was a Mexican hero, so the script would have to be reworked. Convinced that the syndicate was controlled by Communists, Zanuck told Kazan to find locations in Texas, and Kazan chose Roma, Texas, near the border with Mexico. It would be his first outdoor location shoot, and he obviously fell in love with the freedom of being away from a set since the film is filled with an earthy beauty and stunning landscapes. Clearly the criticism by the syndicate had an effect on Kazan, since the character of Fernando, a premature Stalinist, who moves from leader to leader, always seeking the strongest, was written after the meeting. The movie only deals with the parts of the revolution that directly impacted Zapata, so large chunks of the ten years of bloody struggle were slashed from the script. Although it is a compressed version of the Mexican Revolution, and John Steinbeck’s script tries too hard to make the Mexican Revolution stand in for the Russian Revolution, Viva Zapata is still one of the better movies on the revolution.